Electroplate Steel packed by tinned copper is made by the electroplate method with the average tin or tin lead alloy on the surface of copper binding wire. Each coating incorporates tightly between copper coating with steel wire and copper coating with tin coating. It is able to bear from flaking. copper coating and tin coating is uniformity. soft steel core thread, bending proof and the solder point is fastness, whose vibration proof is three or six times as the copper thread. the diathermancy of the steel packed by copper thread is worse than the copper wire. The one-side solder processing doesn't affect other parts, and the weldability of the thicker coating is better. The producibilty ф0.10 is the galanothermy double production manufacturer whose quantity is the most stable and quality is the biggest at present in domestic industry, of which the leading product is ф0.10 and ф0.20 as weaving a high grade product. ф0. The extension rate of ф0.40 and ф1.0 is over 35%, which is the best material for soft conductor. 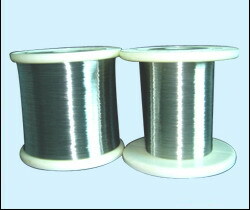 copper clad aluminum wire (CCA), copper clad steel(CCS),etc.